Another taste of Darkest Before The Dawn. 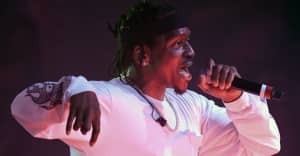 Pusha T's new album is now available for pre-order, and if you purchase a copy of the record in advance, you get "Crutches, Crosses, Caskets" as a reward. The beat is minimal and prickly. Rappers is victimized at an all-time high, Pusha raps, but not I, you pop niggas thought I let it fly. This track echoes the MC's recent interview comments. "I feel like I'm the last rap superhero," he explained to Rolling Stone. "I feel like everybody else, they seem to be a bit victimized and I don't feel like that's me... I look at who the kids look to, and all you see is guys who don't have any real particular base or guys who are just crying in the media about shortcomings and so on and so forth, and it's a bit too much for me... There's not too many rappers you want to be like these days." Listen here, and revisit Pusha's FADER interview.